Evidence suggests that programs that support aging in place may yield cost savings for families, government, and health systems. More extensive research is needed to better account for all costs involved, because existing evidence often relies on small-scale case studies. Aging in place has also been shown to have health and emotional benefits over institutional care. With the United States’ ongoing demographic shift toward an increasingly older population, along with the fact that 89 percent of Americans over age 50 wish to remain in their homes for as long as possible, conversations about the benefits and costs associated with aging in place will become increasingly critical. Recent research on home-based health programs suggests that aging in place can yield potential cost savings at the individual, state, and federal levels. Although the current body of research is limited, these studies demonstrate the benefits of aging in place — benefits that extend beyond cost savings to include social and emotional benefits to both seniors and the broader community. Nursing home expenditures are more than three times those of noninstitutional long-term care services, and approximately one-fifth of nursing home bills are paid out of pocket. The choice to either age in place or enter institutional care is a complex and deeply personal decision that hinges on factors such as the amount of health care needed and the availability of family assistance. However, one reason most older adults choose to age in place for as long as they are able is simply because doing so is the most economical option. Some older people — 21 percent of those aged 65 to 74 and 18 percent of those aged 74 to 84 — own their homes outright and thus no longer have mortgage expenses.1 Others are enrolled in the Federal Housing Administration’s Home Equity Conversion Mortgage (HECM) program, which helps elderly homeowners age in place by allowing them to access the equity of their homes as income.2 (For more information about HECM, see “Aging in Place: Facilitating Choice and Independence”). Source: Federal Interagency Forum on Aging-Related Statistics. 2012. “Older Americans 2012 Key Indicators of Well-Being,” table 33b, 142–3. Note: The 1996 datum for age 85 and over households with incomes below 125% of the federal poverty level is missing. Despite the woodwork effect, these early demonstrations also found that narrow targeting and emphasizing services provided in alternative facilities, such as community centers and senior centers, can result in budget neutrality.20 More recent studies, beginning in the mid-1990s, offer further support for these administrative cost-control techniques. Kane et al. even suggest that to a certain degree, the woodwork effect is necessary to achieve long-term cost savings. Researchers in Oregon found that 2.6 people needed to be served by HCBS to eliminate one nursing home bed. Therefore, serving more people can result in systematic reform and savings in the number of nursing home beds created and maintained.21 More recent studies confirm this finding and even demonstrate cost savings. These studies, along with HCBS waiver requirements, have led most to accept that per-person costs for HCBS are lower than those for institutional care. One study that analyzed state-by-state Medicaid long-term care spending from 1995 to 2005 found that expanding HCBS created a short-term spending increase that was followed a few years later by long-term care savings and a reduction in institutional spending. Spending growth was greater for states that offered limited HCBS services than it was for those that already had established noninstitutional programs. For example, in states with established high-expenditure HCBS programs, nursing home spending declined by 15.3 percent and overall long-term care spending declined by 7.9 percent.22 In states that were expanding their HCBS programs, nursing home spending remained fairly stable for three years following the expansion and then declined in each subsequent year.23 These results suggest that expanding HCBS may require an initial increase in spending that will decrease after the HCBS programs become established, potentially creating cost savings. Kitchener et al. examined 2002 data to compare per-participant expenditure costs for Medicaid HCBS waiver programs with those for institutional care. The researchers found that HCBS waivers produced a national average public expenditure savings of $43,947 per participant for that year.24 In a 2005 survey by the Centers for Medicare and Medicaid Services (CMS), 165,276 nursing home residents indicated that they would like to return to their communities; if they received HCBS waivers to do so, the public could see annual savings of $2.6 billion.25 While it is not feasible for all residents who expressed the desire to return home to do so, the savings would still be significant. However, this study did not attempt to examine whether waiver programs save the state money overall because such savings depend on several factors, including the previously mentioned woodwork effect as well as other research and data issues. These studies demonstrate the benefits of coordinated and integrated care in community settings. Although multiple factors explain the successes and cost savings of these programs, service integration is perhaps the most important one. Integration benefits both patients, who can receive uninterrupted Medicare and Medicaid services in their home or community, and providers, who are often paid for their coordination time and, in capitation programs, enjoy a simplified reimbursement process. These models merit further study and evaluation in the continuing discussion of aging in place. Because of these emotional, social, and health benefits, LaPlante recommends creating a cost-benefit framework that takes into account the quality of life differences between aging in a nursing home and in the community. This framework would also define independence as more than simply living outside an institution. 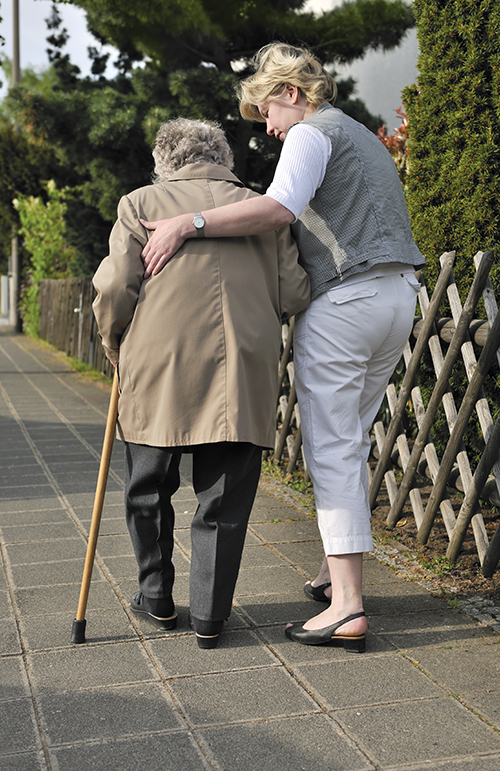 True independence for the elderly involves control over their own lives and meaningful participation in the community; receiving services at home or in the community can play a large role in gaining this independence.49 A cost-benefit framework would allow more accurate comparisons between institutional care and HCBS. The costs of aging in place will continue to be an issue for years to come. Researchers estimate that expenditures on community long-term care services could surpass nursing home expenditures as soon as 2015 or 2016.50 Costs are always important, especially in tight budget climates, and the potential cost savings from expanding HCBS programs predicted by some studies are promising. However, more research is needed that takes into account all the costs and benefits of aging in place. “Free and Clear American Homeowners.” Zillow Real Estate Research Website (www.zillowblog.com/research/2013/01/09/free-and-clear-american-mortgages/) Accessed 31 October 2013. Consumer Financial Protection Bureau. 2012. “Reverse Mortgages: Report to Congress,” 16. Elinor Ginzler. 2012. “From Home to Hospice: The Range of Housing Alternatives,” in Independent for Life: Homes and Neighborhoods for an Aging America, ed. Henry Cisneros, Margaret Dyer-Chamberlain, and Jane Hickie, Austin: University of Texas Press, 55. H. Stephen Kaye, Charlene Harrington, and Mitchell P. LaPlante. 2010. “Long-Term Care: Who Gets it, Who Provides it, and How Much?” Health Affairs 29:1, 17–8, 21. MetLife Mature Market Institute. 2012. 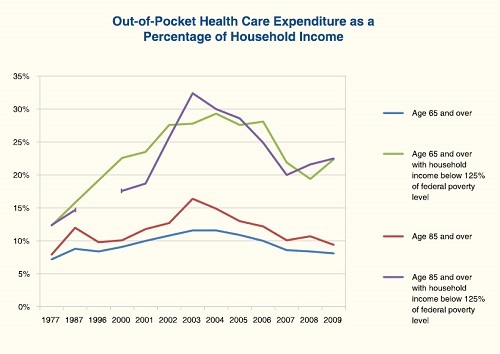 “Market Survey of Long-Term Care Costs,” 4. Federal Interagency Forum on Aging-Related Statistics. 2012. “Older Americans 2012: Key Indicators of Well-Being,” 57. Kaye et al., 2010, 18. U.S. Department of Health and Human Services. 2013. “What’s Medicare?” 1–4. Mitchell LaPlante. 2013. “The Woodwork Effect in Medicaid Long-Term Services and Supports,” Journal of Aging &Social Policy, 25:2, 161–80. Karen Dorman Marek, Frank Stetzer, Scott J. Adams, Lori L. Popejoy, and Marilyn Rantz. 2012. “Aging in Place Versus Nursing Home Care: Comparison of Costs to Medicare and Medicaid,” Research in Gerontological Nursing 5:2, 123–9. Terence Ng, Charlene Harrington, and Martin Kitchener. 2010. “Medicare and Medicaid in Long-Term Care.” Health Affairs 29:1, 22–8. Martin Kitchener, Terence Ng, Nancy Miller, and Charlene Harrington. 2006. “Institutional and Community-Based Long-Term Care,” Journal of Health and Social Policy 22:2, 31–50. H. Stephen Kaye, Mitchell P. LaPlante, and Charlene Harrington. 2009. “Do Noninstitutional Long-Term Care Services Reduce Medicaid Spending?” Health Affairs 28:1, 262–72. Janet O’Keeffe, Paul Saucier, Beth Jackson, Robin Cooper, Ernest McKenney, Suzanne Crisp, and Charles Moseley. 2010. “Understanding Medicaid Home and Community Services: A Primer,” 21–36; Allen J. LeBlanc, M. Christine Tonner, and Charlene Harrington. 2001. “State Medicaid Programs Offering Personal Care Services,” Health Care Financing Review 22:4, 155–73. Pamela Doty. 2000. “Cost-Effectiveness of Home and Community-Based Long-Term Care Services,” U.S. Department of Health and Human Services. Andrea Wysocki, Mary Butler, Robert L. Kane, Rosalie A. Kane, Tetyana Shippee, and Francois Sainfort. 2012. “Long-Term Care for Older Adults: A Review of Home and Community-Based Services Versus Institutional Care,” Comparative Effectiveness Review No.81. R. Kane and R. Ladd. 1998. “The Heart of Long-Term Care,” New York: Oxford University Press. As cited in Doty, 2000. Karen Dorman Marek, Lori Popejoy, Greg Petroski, David Mehr, Marilyn Rantz, and Wen-Chieh Lin. 2005. 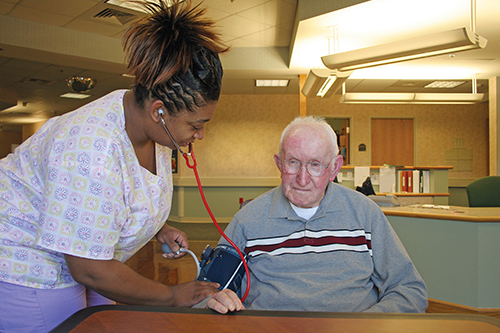 “Clinical Outcomes of Aging in Place,” Nursing Research, 54:3, 202–11. “Arizona Long Term Care System,” County Supervisors Association of Arizona website (www.county-supervisors.org/uploads/ALTCS%20Overview.pdf). Accessed 31 October 2013. Tanaz Petigara and Gerard Anderson. 2009. “Program of All-Inclusive Care for the Elderly,” Health Policy Monitor Survey No.13. “What is PACE?” National PACE Association website (www.npaonline.org/website/article.asp?id=12&title=Who,_What_and_Where_is_PACE?). Accessed 31 October 2013. Victor Hirth, Judith Baskins, and Maureen Dever- Bumba. 2009. “Program of All-Inclusive Care (PACE): Past, Present, and Future,” Journal of American Medical Directors Association 10:3, 155–60. Charlene Harrington, Terence Ng, Stephen H. Kaye, and Robert Newcomer. 2009. “Home and Community Based Services: Public Policies to Improve Access, Costs, and Quality,” University of California, San Francisco Center for Personal Assistance Services. Jennie Chin Hansen and Andrew Scharlach. 2012. “Community Services,” in Independent for Life: Homes and Neighborhoods for an Aging America, ed. Henry Cisneros et al., Austin: University of Texas Press, 77; Lynn Feinberg, Susan C. Reinhard, Ari Houser, and Rita Choula. 2011. “Valuing the Invaluable: 2011 Update, the Growing Contributions and Costs of Family Caregiving,” Insight on the Issues 51, 1. David C. Grabowski. 2009. “The Cost-Effectiveness of Home and Community-Based Long-Term Care Services,” presentation for the Hilltop Institute Symposium, Home and Community-Based Services: Examining the Evidence Base for State Policymakers. Ernest Gonzales and Nancy Morrow-Howell. 2009. “Productive Engagement in Aging-Friendly Communities,” Generations 33:2, 51–8.